If your ancestor owned land, you probably know to look for their names in deed books and on plat maps. But did you know there’s another resource that can help you locate their land and also show you their neighbors? In March 1867 to help improve land, the Indiana legislature passed a law (Acts of 1867, Chapter 99) allowing landowners to petition for ditches and drains to be created on their land. This law also benefited the state—improved drainage meant more land could be used for planting crops or putting up buildings, which meant higher property taxes could be assessed. These drainage petitions were to be filed with the county commissioners, and because it would have an effect on adjacent land, the petitions not only had to give a technical description of the ditch or drain, they also had to list the names of the petitioner’s neighbors and give the legal descriptions of those lands. This law was in effect for several decades—the petition shown here is from 1905, and shows all the neighbors in Sections 26 and 35 of Township 17 North, Range 1 East in Hendricks County. Note how some of the land parcels are held by a group of people, and some by a guardian on behalf of their ward—a boon to a researcher. Summer is heating up! 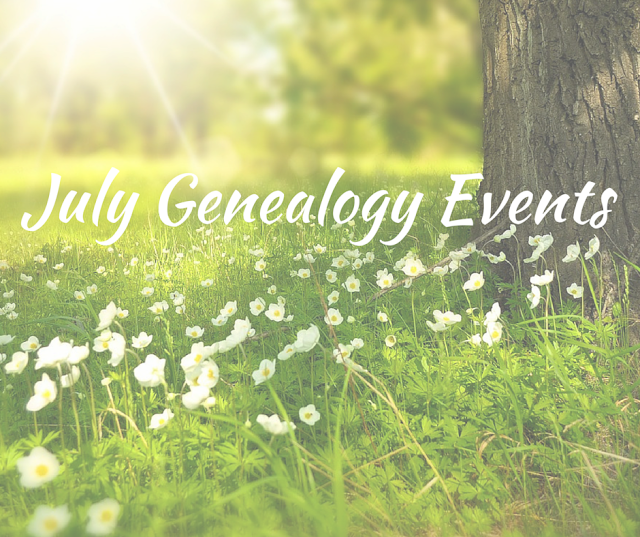 Beat the heat and check out these cool genealogy events! Genealogy Special Interest Group, Goshen Public Library, 601 S. 5th St., Goshen. 10am-12:30pm – Open to everyone! Wabash Valley Genealogy Society: Cemetery Committee – “Navigating Find-A-Grave: The Good and Bad of Online Memorials.” 6:30pm at the Vigo County Public Library, 1 Library Square, Terre Haute. 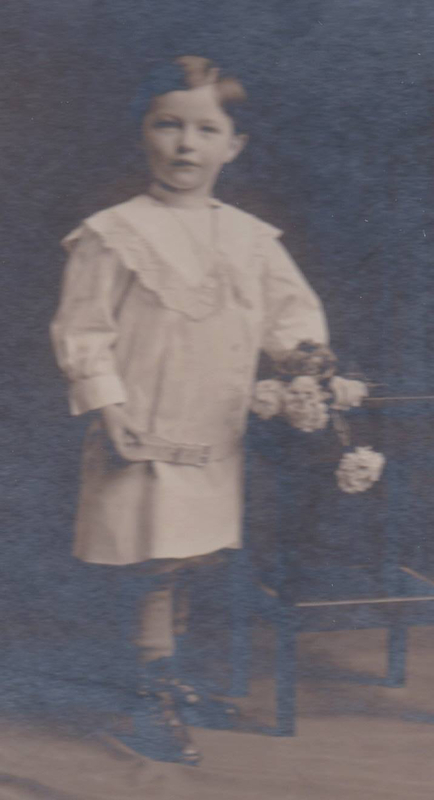 Warsaw Community Public Library: 11:00am to 12:00pm – Questions and Answers About Genealogy, presented by Teresa Crews.Warsaw Community Public Library, Meeting Room C, 310 East Main Street, Warsaw. will feature members demonstrating various software programs and websites, including Shutterfly/This Life Photo. All meetings are free and open to the public. First Presbyterian Church, 200 East Beardsley, Elkhart, Indiana. Use the East door. Elkhart County Historical Museum: 10:00am - Have an item you think belongs in a museum? The Elkhart County Historical Museum staff will sponsor “The Do’s & Don’t of Museum Donations.” 304 W. Vistula St., Bristol. Kokomo-Howard County Public Library: 9:15am – 11:30am – Genealogy Basics Class – . This free class will cover the basics for the first-time genealogy researcher. We’ll meet in Meeting Rooms A&B in the lower level. Feel free to bring your laptops. We’ll provide handouts. To register, call the Genealogy & Local History Department at 765.626.0839. KHCPL Main, 220 N. Union St., Kokomo. Twigs Meeting – Picnic in South Bend City Cemetery 6pm- Yes, we’re talking about a cemetery picnic! Join us as we discuss the history of South Bend City Cemetery and ongoing efforts to revitalize this important landmark! We will meet near the front gate at 6:00pm RSVP to Lisa Ellam ellam.lisa@gmail.com. Genealogy Center, Allen County Public Library: "Beyond Just Starting." You will learn how to verify the family information you find, and the importance of documenting what you find and where you found it. You can also discover how to harvest as much information as possible from various records. We will also show you how to use the free FamilySearch website, and provide a virtual tour of The Genealogy Center’s licensed databases. This 90-minute class is designed for beginners – or for anyone who wants to ensure that the best paths to success are being utilized. 9:30am, Meeting Room A, Allen County Public Library, 900 Library Plaza, Fort Wayne. Wabash Valley Genealogy Society: Rob Johnson – “Eastern and Southern States Research.” 10:00am at the Vigo County Public Library, 1 Library Square, Terre Haute. New Databases: Marion, Monroe, Porter, and Shelby Counties - and More! Just in time for the long 4th of July weekend, we have new databases on the Indiana Genealogical Society website! Searchable digital images of listings from a 1930 business directory for the city of Bloomington. 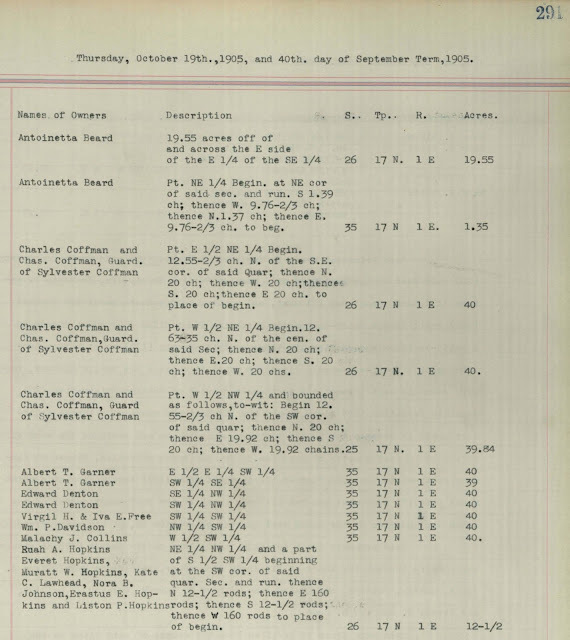 This database was contributed by Wayne Klusman. The following new databases are available to IGS members. Not a member? Join today! 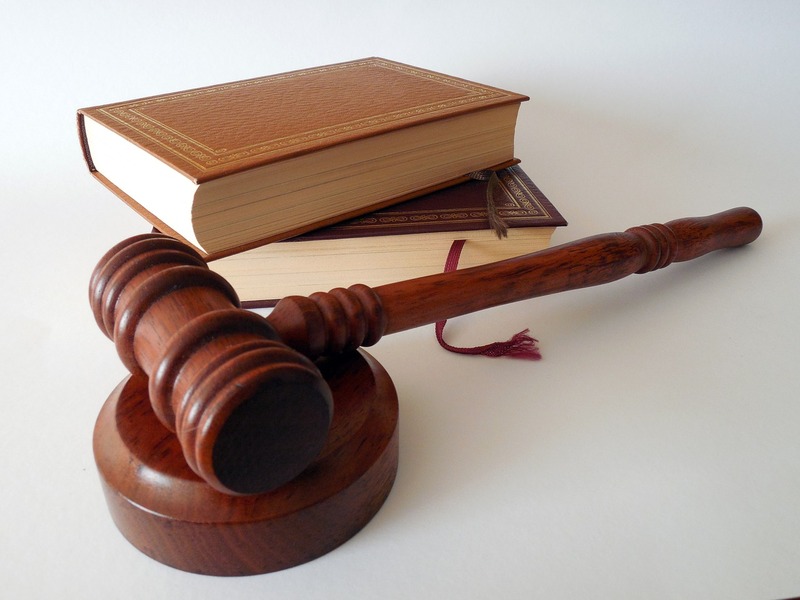 An index of 250 divorce cases that were originally filed in Marion County courts but were later transferred to Hendricks County courts, as listed in Hendricks County Circuit Court order books. An index of 300 students in grades 9-12, as listed in the school’s 1923 yearbook, The Valenian. Searchable digital images of students in grades 9-12, as listed in the school’s 1939 yearbook, The Squib. This database was contributed by Ron Darrah. Searchable digital images of teachers in grades 9-12, as listed in the school’s 1939 yearbook, The Squib. This database was contributed by Ron Darrah. An index of almost 19,000 students and their hometowns, as listed in the school’s annual catalogs. The school opened in 1865 for the training of teachers and later changed its name to Indiana State University. An index of 55 staff and their positions, as listed in the school’s 1959 yearbook, ReVoo. This database includes digital images. An index of 375 students in the freshman and senior classes, as listed in the school’s 1959 yearbook, ReVoo. This database includes digital images. Searchable digital images of men from Indiana and Ohio who participated in a Civilian Military Training Camp (CMTC), as listed in the camp’s 1926 yearbook. This database was contributed by Ron Darrah. Join IGS Now and Save! 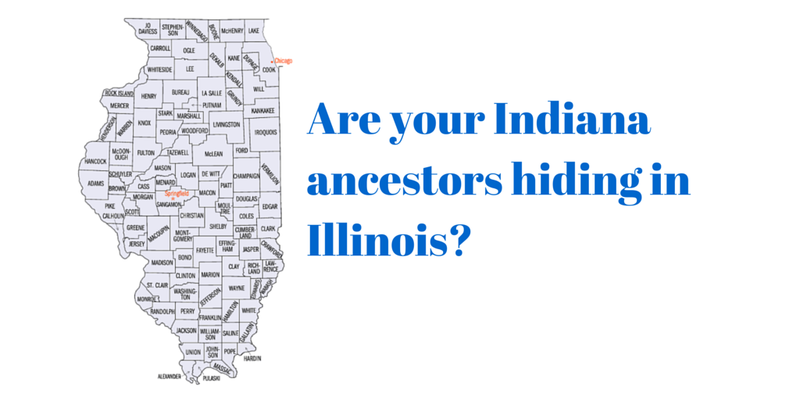 Want to save money on your Indiana genealogy? Join the Indiana Genealogical Society now! Join before September 30 and your membership will be only $20 (normally $30)! This offer is also good if you've let your membership lapse. Renew your membership before September 30 and renew for only $20! 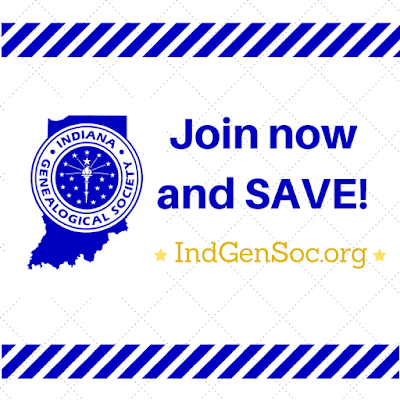 Access to our Members-Only section, which includes 1,500+ databases as well as the current issues of IGS Newsletter and Indiana Genealogist. A subscription to our monthly e-mail, Indiana News, which is filled with items of interest to the Indiana genealogy community. A 50% discount on Find My Past's World annual subscription, which includes the Periodical Source Index (PERSI), records from the United States and the United Kingdom + Ireland. That's $100 in savings. A discount on selected publications in the IGS Shop. IGS will send you an e-mail (usually within 72 hours of your purchase) notifying you when your membership login for the Members-Only section has been activated and is ready to use. Your membership will still expire on December 31, 2015. However, you will have access to all of the 2015 issues of Indiana Genealogist and IGS Newsletter.